Der Artikel Abbey Lincoln (1930-2010): Four Classic Albums wurde in den Warenkorb gelegt. Joining our fine and ever expanding catalogue of fantastic female jazz performers we welcome the wonderful singer, songwriter and actress, Miss Abbey Lincoln. Born, Anna Marie Wooldridge in Chicago and raised in Michigan, she performed under her stage name Abbey Lincoln having fallen under the spell of such great jazz singers as Billie Holiday, Dinah Washington and Ella Fitzgerald. Abbey wrote many of her own songs and as her career progressed she became more politically active and this was reflected in her lyrics. Our four selections feature her second, third, fourth and fifth albums and the progression is there for all to hear! 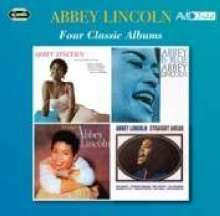 If you want to know just how good a jazz singer Miss Lincoln was, firstly, of course, just listen to these four albums. And then take a look at the personnel across all four of them, you will be astonished! You will read and gasp at the names of many jazz greats from Sonny Rollins, Kenny Dorham, Wynton Kelly, Paul Chambers, Max Roach (Mr Lincoln, for a time! ), Stanley Turrentine, Julien Priester, Cedar Walton, Philly Joe Jones to Benny Golson, Jerome Richardson, Art Farmer, Curtis Fuller, Coleman Hawkins, Booker Little, Art Davis and Eric Dolphy. In 1960 she joined up with husband Max Roach for his fiery protest album “We Insist” which we heartily suggest you take a listen to. Hörprobe Track 14: Brother, where are you?